Changing the path corporations and the 1 percent have set for our planet is going to take more than a march. It’s going to take a struggle. As I admired the view across First Avenue, I was well aware that few in the city, including in the elite precincts of our national security–obsessed national media, could be bothered to notice what was happening in the room where I sat. I listened as voice after voice representing these hard-hit communities—Indigenous, African-American, Latino, Asian Pacific Islander, poor and working-class white communities, as well as representatives from the front lines in South America, Africa and South Asia—got up and spoke, some with tears. They were talking not about some distant threat of climate catastrophe but the catastrophes that are already upon them. I listened to Damaris Reyes of the group Good Old Lower East Side (GOLES), who told of the horror her family and community endured during and after Hurricane Sandy (“our community saved our community,” she said, not any government response), and to retired Harlan County coal miner Stanley Sturgill of Kentuckians for the Commonwealth, who spent decades digging up the stuff that not only poisoned his body—with black lung disease—and his beloved Appalachia, but also helped supercharge the Sandy surge. We demand that world leaders support and move money to our community-led priorities and local infrastructure needs to build sustainable community economies, energy democracy, zero waste, food justice, public transit and affordable housing—pathways that can create millions of long-term jobs and put our communities back to work. We support Indigenous peoples, our brothers and sisters of the North and the Global South, in their climate justice struggles linking land and water rights, land title and the full implementation of the UN Declaration on the Rights of Indigenous Peoples. Of course, nobody expected a red carpet reception. But it would have been nice to be noticed by at least some of the media who covered—and a lot more of the groups who organized—the People’s Climate March two days before. Perhaps anticipating the lack of interest—or, at least, the difficulty of being heard above the usual noise—the Climate Justice Alliance had put out a call to action well ahead of time, encouraging friends, allies and supporters in New York City and beyond to engage in nonviolent direct action in the days before or after the People’s Climate March, drawing attention to the urgency of their demands. 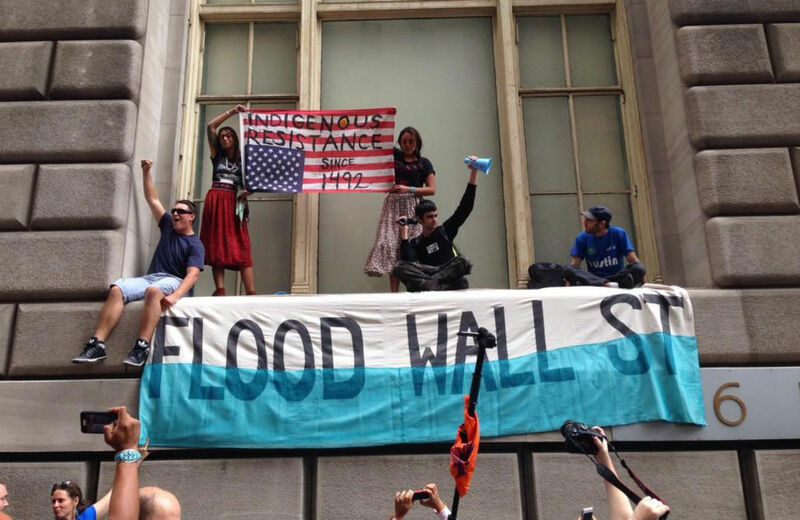 On Monday, in the streets of Manhattan’s financial district, came a resounding answer to that call—when the large and well-organized Flood Wall Street protest, more than a thousand strong, swept out of Battery Park and noisily, defiantly and yet peacefully occupied multiple blocks of Broadway near Wall Street from mid-day into the night. Ultimately, 104 were arrested for their civil disobedience. Monday’s Flood was planned and announced weeks in advance, and it did make it into the master media narrative around the march. What’s interesting, though, is how its solidarity with frontline communities, and the Climate Justice Alliance in particular, was downplayed or, mainly, overlooked. So, yes, let’s celebrate the People’s Climate March and all its diversity, as I wholeheartedly do. But until the people represented by the Climate Justice Alliance are taken as seriously in our national media and national politics, and inside the UN, with seats alongside those of the one percent—and until the indignity of having to deliver legitimate demands for universal human rights on a street corner, harassed by police, is forever remedied—then all our celebrations will be empty words. The real celebration of that diversity, I want to say, was at Broadway and Wall Street—where those many hundreds marched and sat down in the street to disrupt business as usual and bear witness to the ongoing crimes against humanity committed by an industry, and a political-economic order, doubling down on destruction. Those voices and bodies, animated by love and anger and an iron resolve, refuse to be ignored. They know what it takes. They know it takes struggle. They know that a sea of well-behaved people—even 400,000 of them—ain’t gonna change history by itself.